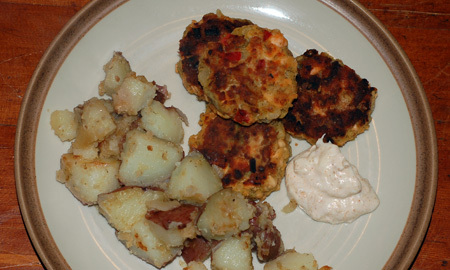 In case anyone wants to know, leftover fried fish can be acceptable, and even pretty tasty, fishcakes. When we were on our way to the airport with my folks after Christmas, we stopped at a McCormick and Schmick’s for lunch, where my mother and I both ended up ordering the cod fish and chips. Nolan threw a teething fit and refused to even sit in proximity to solid food, and we were concerned about getting to the airport on time, so I came home with most of the fish and chips in a doggie bag—probably about 3/4 lb of flaky cod. There was no way the batter was ever going to recrisp, so I just broke up the fish, batter and all, and made it into codcakes. For bulk, I steamed and riced 5 red potatoes, and added two crumbled up slices of white sandwich bread; I seasoned it with some grated onion, salt and pepper, and bound the whole lot together with two eggs. 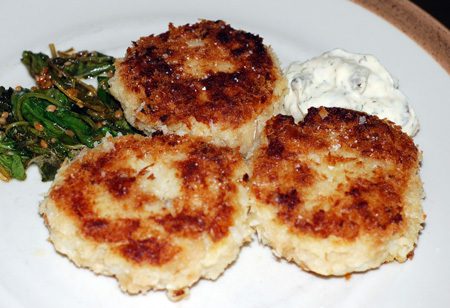 This constitutes my basic fishcake recipe, and I use it frequently with all manner of leftover fish, particularly cod, halibut, and salmon. Sometimes I’ll dip the patties in a dusting of flour or panko crumbs, but I skipped that this time because of the extra starch from the batter. I served the codcakes with some arugula I sauteed with olive oil and garlic, and a quick dipping sauce that contained, I believe, mayo, Dijon, and some dill (the salmon variation above had a sauce of plain yogurt with mayo, lemon, and smoked paprika). Usually Nolan likes these a lot, because they are crunchy and starchy and contain fish, but the dreaded molars were still keeping him from eating; in fact, only one has fully erupted so far, so this is an ongoing problem that I will be very glad to see the end of.